You would be an Aquarius woman if you were born between January 20th through February 18th, depending on the year. 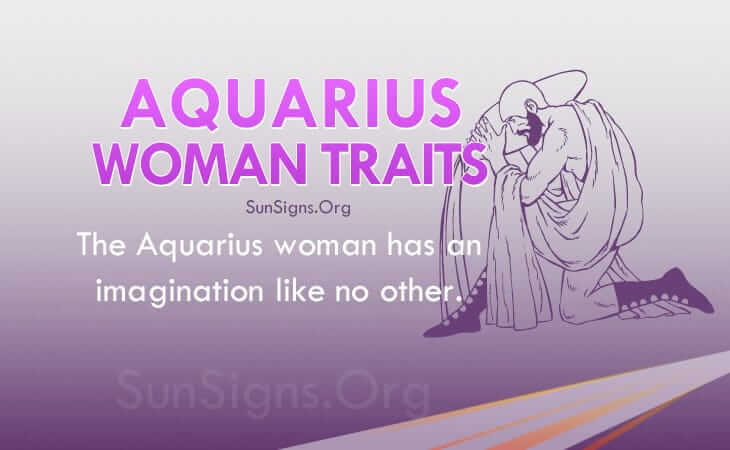 The Aquarius woman traits show that she has an imagination like no other. She is one amazing lady. There are so many ways to be creative and so many things that a woman can do with her creativity. It is equally likely that an Aquarius female will spend her days painting beautiful pictures as it is that she will waste the day by sitting around and daydreaming. Aquarius ladies have a wild sense of adventure that seems to have been with them since they were born. As a young girl, this Water Bearer is likely to have played pretend often, pretending to be in far away or mythical places. One thing is true of all Aquarius women characteristics: they need to feel free. The Aquarius woman personality shows she will not be happy if she does not have an adequate amount of freedom. She needs to feel like she can get up and leave whenever she wants to. As the Aquarius girl grows up to be an intelligent and imaginative Aquarius woman, it is likely that she will play out these adventures that she once only pretended to do. The Aquarius woman traits show she can be very sociable. She is both a good listener and a great speaker. She has a way with words and can easily captivate an audience just by telling a story. She is respectful of others when they are talking, and she knows better than to interrupt. The Aquarius female can give unbiased advice when she is asked for it, but she will not give advice that is not wanted. She is very courteous when it comes to what other people feel comfortable with. While the Aquarius woman personality gives advice, she doesn’t like to be adviced. She could care less what other people have to say about her, and she won’t let their opinions change her character. She will be herself no matter who has a problem with it. This can sometimes make Aquarius women seem stubborn. An Aquarius zodiac sign female won’t want to be pinned down to a desk job, and she could care less how far she gets in a career. She would rather travel the world, be a freelancer, or have a career that takes her to exotic places. She wants her life to be an adventure, and she knows that a desk cannot provide much of that. The Aquarius woman traits show she doesn’t care much for financial stability. She will get by on whatever she can, doing odd jobs to make some spare cash. She lives for the moment and does not often think very far ahead. While the Aquarius woman is intelligent, she sometimes can lose sight of the real world. Once the Aquarius female finds someone interesting who shares her passion for life, she will fall in love with them very quickly. However, the Aquarius woman has trouble showing affection to her partner, and she will be slow to marriage. The Aquarius woman characteristics show she will be most attracted to someone who seems mysterious or adventurous. They know that they don’t want to end up with a boring partner. To be in a happy relationship, the Aquarius woman needs to be with someone who is as intelligent and adventurous as she is. The Aquarius woman zodiac traits show she would rather be dating for years before she commits herself to be married. She will need to know that her independence will still be intact once she gets married. If she is not sure of this, then she is sure to turn down a proposal. Once married, the relationship will continue to be an adventure, and the two may even have children to join them on their adventure. The Aquarius woman is an adventurous lady to be with. This is quite spot-on. I feel like the writer knows me personally. I am an Aquarius girl, some of this fits me. I’m an Aquarius girl and this is SO FAR FROM THE TRUTH. It actually seems like a lot of this, I’m the exact opposite. I think very far in advanced, I’m not one for adventure at all, I really depend on financial stability and I married very fast. I can’t stand odd jobs, as I need stability and while I need freedom to do as I please to make things happen — I’m very set on a career path. I’m not sure where this came from, but it’s very wrong about my personality traits. Always look at your year of birth. It really helps to compare Chinese astrology to your personalty traits. Along with Western astrology. I totally agree with you! While I do love my freedom, I am very passionate and give much love and attention to my partner. I am very attached to the ones I love. I hate not having money and I needed to feel secured (I’m a banker). I also strive to do my best in my career and having odd jobs would make me insecure. So noooo not me either. The person wrote this seems to know me . it feels so awesome to know out there, there’s someone who understands me and there are people like me .